Last night was amazing. 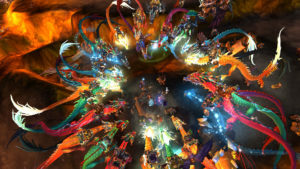 For hours hundreds of players from Argent Dawn EU gathered round to await the beginning of Battle for Azeroth. The atmosphere was playful and fun without any negativity or griefing. I was magical and I thank you all for that Argent Dawn! When the quest popped for Magni Bronzebeard the rush was on, people were racing to experience the new shiny in their way of choosing. Me, I had a plan! See I thought one thing I had never done I would take a stab at/ I planned precisely knowing that I was spoiling myself only a wee bit and the rest I would take as it comes. So when Magni’s summon came, I was ready! I accepted the quest and tiger dashed away to the portal. I knew this route. I practiced it two times in beta. I did each quest skipping every cut scene except two that had not been in beta. I was not worried about screenshot or exploring. I had done that just three days prior to ensure I had the best chance. Each quest and cut scene flew by as I noted how many people were at each juncture as I passed through. Finally the end was in site, two new cut scenes played out in my journey and these I did chance to watch hoping others doing the same as I would be too. Finally arriving at the docks of Boralus my goal was in site. I shifted into travel form changing gear sets by macro as pre-set and practiced till I came to my objective. Good fortunes, I was so excited, NO ONE was here. I had made it first and with my nerves in a flutter and excitement high I spoke to Alan Goyle and learned the newest fishing skill. I readied myself casting buffs and settled in. My testing showed one hour to one hour twenty minutes. The race was on and I was going for something I have never tried before… Realm First. Okay so here we will break away from this tale just a bit for those in the audience who see where this is going to let it out, have a good laugh, guffaw or jeer… 😀 Right, if we are all ready then, let’s continue! With my nerves high I set pole to water, casting and reeling as fat as the game would let me. For nearly ten minutes not a single person had arrived. No sooner had I thought upon that when the other players started appearing. They trickled in at first and it continued for a wee while until dozens had come and gone. 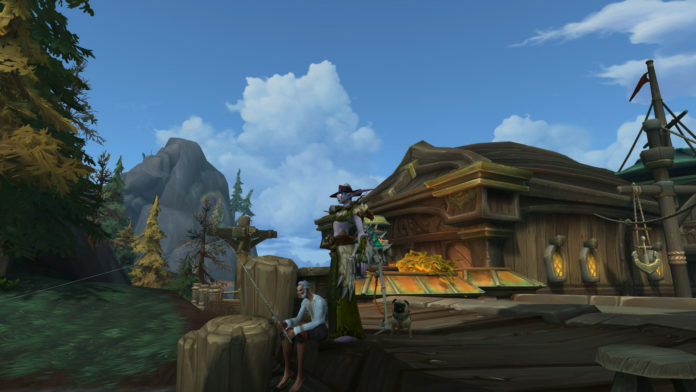 Most of them training and leaving but a few, seeing me standing there fishing like a madwoman, simply turned and left. On about forty minutes a challenger finally arrived querying me about my skill level and how long I had been here. We fished together for about five minutes till he decided it wasn’t worth his effort tonight. So he cheerily bid me good luck and logged off but not before asking me to update him on how I fared by in game mail. 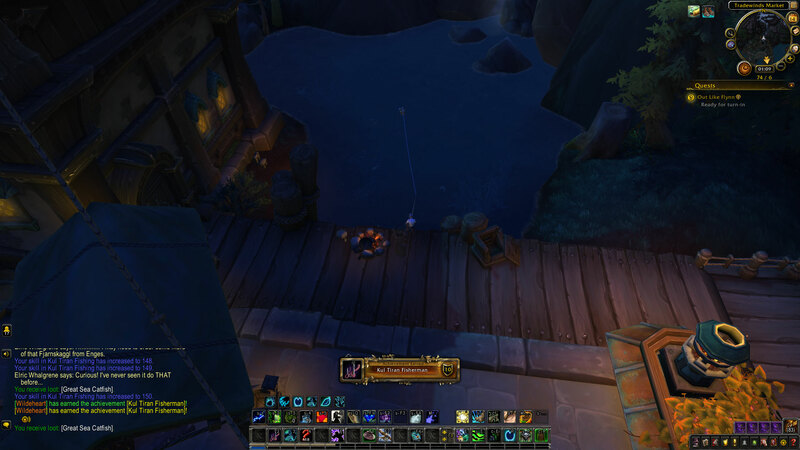 The final cast and the achievement rang out Kul’ Tiran Fisherman! I let out a small whoop, had I really done this?! Then noticed something…. There was nothing else… no other messages in chat, no notice alongside my achievement of Realm First. What happened? Had someone beat me? Did I miss a message? I scrolled back frantically trying to see one, nothing. I quickly put in a ticket to query if there was a bug. I then asked in Trade chat and as the responses came back my heart sank… Seems I did not research things well enough. Realm Firsts were no more! I did a quick Google search to confirm this was true. Blizzard Entertainment had indeed removed them for Battle for Azeroth. It was now half past twelve and I was not sure what to do. 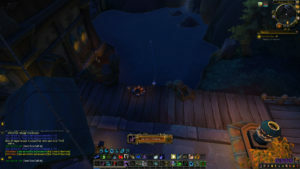 I looked back at my time and I was very happy just a few seconds past one hour to level my fishing. I had done well and despite there being no confirmation. I like to think I would have been very, very close to achieving my goal. With my nerves still firing I decided I did not want to continue on exploring. Besides it was dark and there would be far better screenshots to be captured by the light of a new day. 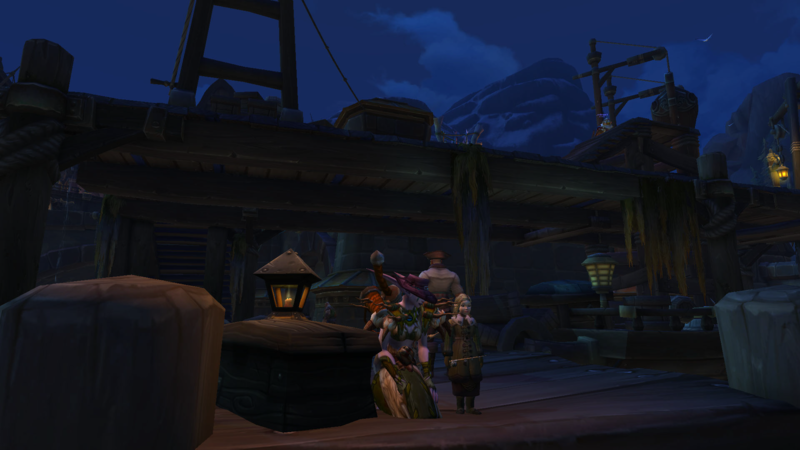 I found a lovely place on the docks of Boralus and fished alongside a pleasant wee lass for another two hours before retiring for the night. Despite not getting Realm First I had a wonderful and exciting first few hours in Battle for Azeroth and for all my efforts I was still rewarded well. 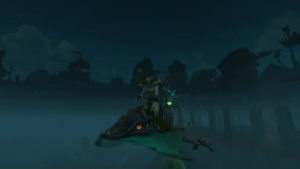 I managed to complete three achievements one of them was called Catchin’ Some Rays which is fishing up a rare mount, the Great Sea Ray, that is a recolour of the Darkwater Skate. So with a new mount and some fun memories I am off today to begin my adventure through Battle for Azeroth! Previous articleWin, lose or Draw? Next articleBattle for Azeroth: First Impression in Pictures! Good luck ahead 🙂 I hope to join you and be able to play tonight or tomorrow! Thank you. I was amazing fun and I have a great memory now. I will most assuredly be taking many more night time screenies they can be so atmospheric! Haha, gosh. That was absolutely brilliant! 😀 Priceless indeed! A grand adventure! I love the goal and the excitement, lets go play. Yeah, Argent Dawn players are amazing, I just feel like transferring a bunch of my chars there, it is such a fun and magical realm.